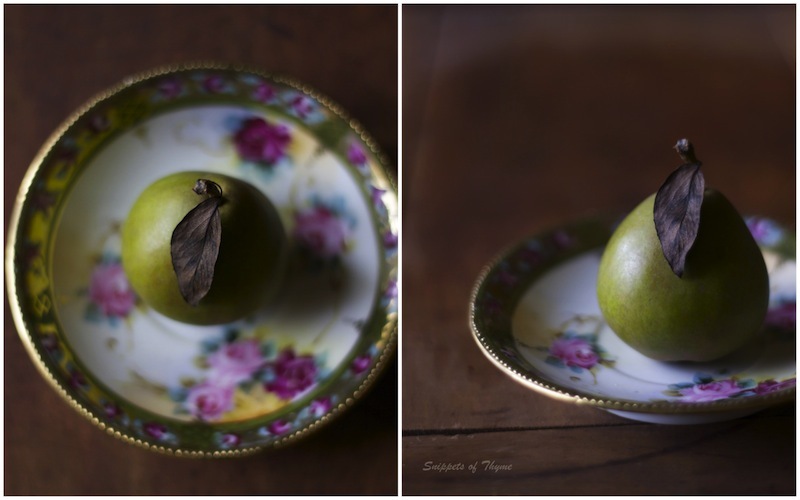 P. came home from work the other day with the tiniest most adorable little pears for me. "A co-worker enjoys your blog and picked these for you." he smiled as he held them proudly for me to admire. "Really?" I asked incredulously. "I've never met this person and they thought to bring some pears for me?" Is that not what just makes all those small moments of life so curiously entertaining and heart warming? Isn't that just the best of human nature? 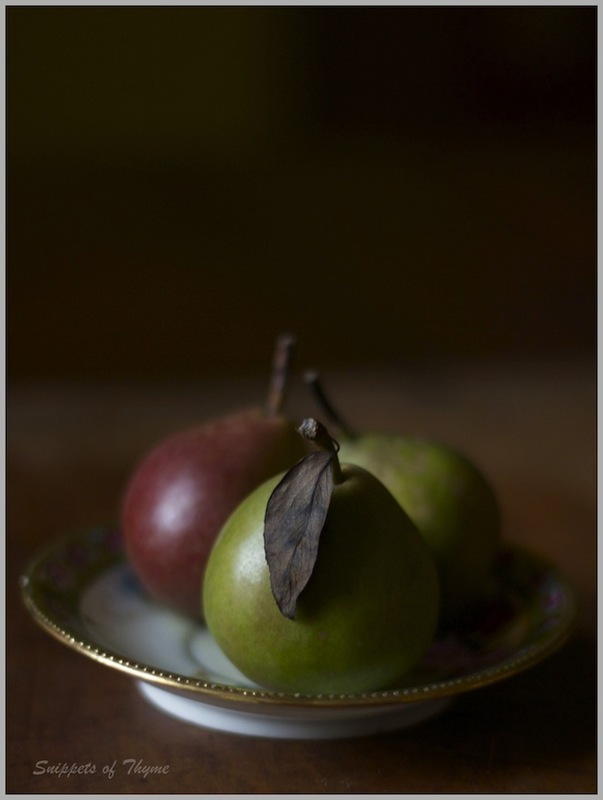 With these little graceful pale green pears in hand, I wondered what I might make that would celebrate these little gifts. In mere minutes, my mind travelled through the world of recipes and photos in this marvelous family of food photographers. I easily landed at this visual gift of a blog here. I'm sure most all of you have seen this most serene and ethereal of food blogs ~ Roost. 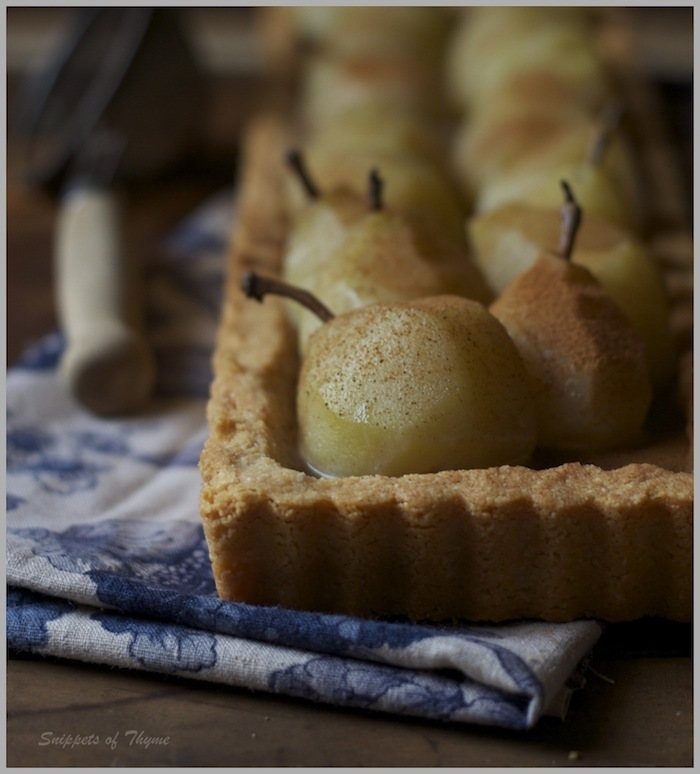 A sweet petite poached pear tart with Chai spiced custard it would be. Something whimsical and pretty. Have you peered at pear leaves up close? They are beautiful little pieces of art work...with little shimmers of stained glass texture. Next time you see some pears, look closely, you'll be surprised at the beauty discreetly woven into the tiny slender leaves. What an interesting recipe this turned out to be. The almond crust forms wonderfully to the tart mold and bakes beautifully. The aroma of toasting almonds is a heady scent. 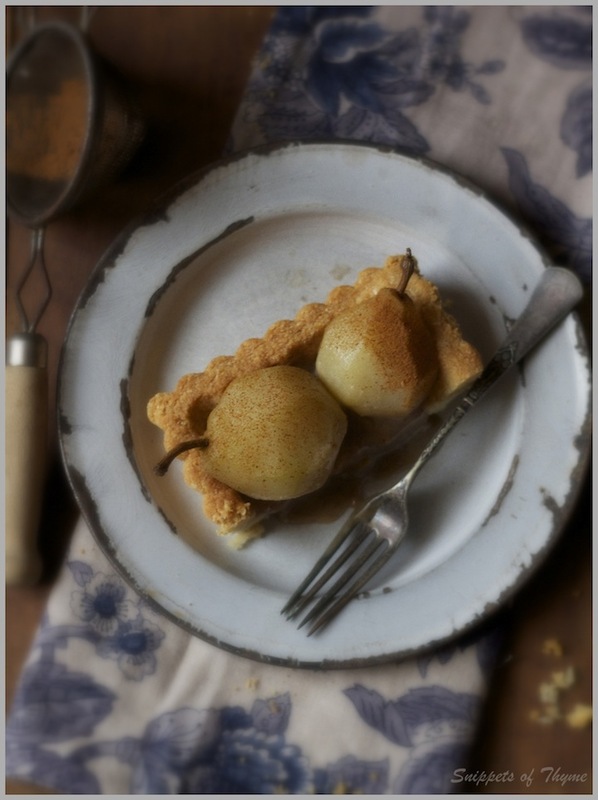 The pears steeped in Riesling wine and poached with vanilla, cinnamon, and honey also have to be one of the most lovely scents that can fill a home. The Chai custard presented gentle and exotic flavors for us. My local Whole Foods was out of the ingredient 'cocoa butter' that day so I used butter. I am curious to make the custard with it to know how different it would be in texture and taste. Enjoy! I know we're on the opposite side of fall but I couldn't resist! Combine all ingredients in a bowl. Grease a 13x5 rectangular tart pan and form the crust with the dough. Bake at 350˚ F for 15 minutes or until edges are slightly golden brown. Place all ingredients except for pears in a stock pot and bring to a bowl. Meanwhile peel the pears (I left the stem on for presentation) and cut in half lengthwise. Using a paring knife remove the core and bottom. Once liquid is to a boil carefully place pears in liquid and reduce to medium heat. 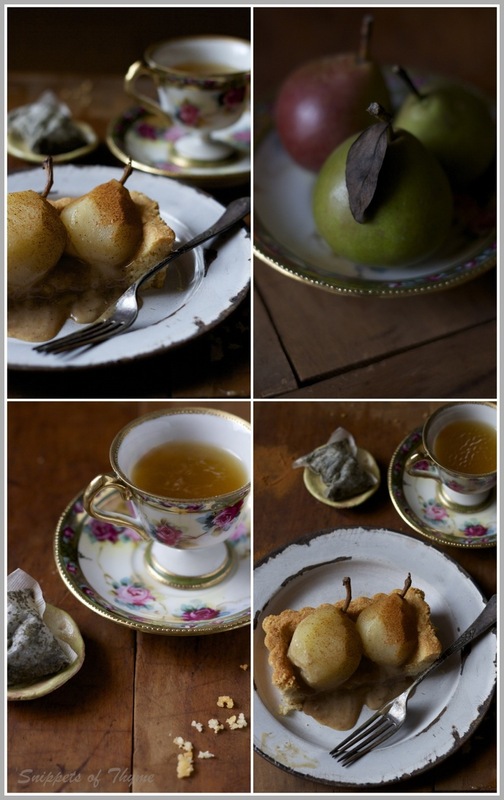 Cook pears for 45 minutes to an hour or until very tender. Place honey and water in a sauce pan and bring to a boil. Reduce heat and add cocoa butter, star anise and spices. Remove from heat and let sit for 15 minutes. Discard star anise and return pot to heat. Bring to a simmer and add the egg yolks stirring constantly with a wooden spoon. Stir and stir some more until the custard coats the back of the spoon and when you run your finger across it leaves a streak. Be sure to not overcook!! Remove from heat, pour custard into a metal or glass bowl, stir in vanilla seeds and place in the fridge (the freezer will expedite this process). The custard will thicken significantly as it cools. After 30-45 minutes or so the custard should be set (less time if put in the freezer). When serving you do not want the custard to be super cold and definitely not frozen so as soon as it thickens take it out and pour in tart shell. 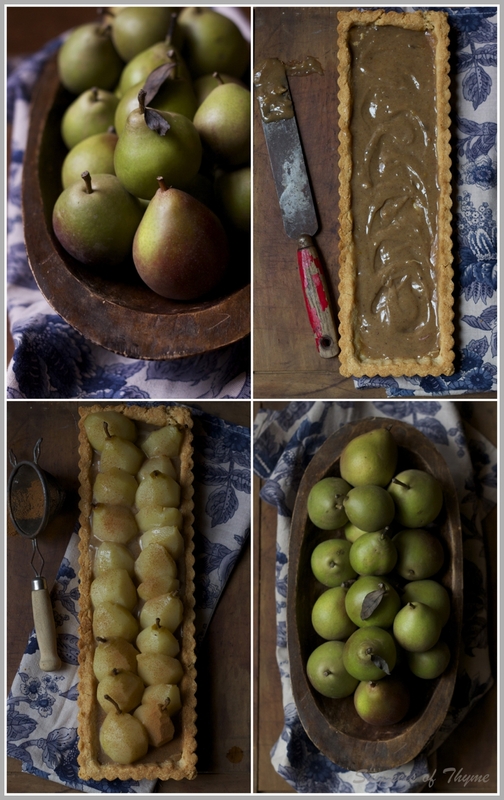 Fill tart shell with custard and place the poached pears on top. Sprinkle with cinnamon and serve.